Before coming to Washington, Ryan Zinke hosted a radio program that featured guests who disputed climate science and cast doubt on President Obama's birthplace. The Interior secretary in 2013 hosted a show on the Military Appreciation Channel called "Commander Z." He described himself in the first episode as the chairman of Special Operations for America, a super political action committee that had supported Mitt Romney's presidential campaign but was now pivoting to "keep the opposition honest and make sure what we say is well-documented, well-researched." CNN first reported that Zinke invited a self-described birther onto his show, discussed conspiracy theories about then-President Obama's college records and speculated about whether first lady Michelle Obama could have connections to the 2013 Boston Marathon bombings. According to recordings reviewed by E&E News, Zinke also discussed the "myth" of global warming on his show with Edwin Berry, a meteorologist and climate doubter whom the Heartland Institute floated for a spot on EPA's Science Advisory Board (Climatewire, Sept. 14, 2017). Zinke spent part of the half-hour program comparing the ecological impact of wind energy to that of fossil fuels, saying it's often easier for wildlife to live around oil wells than around wind turbines. "I'm an advocate of wind, but there's a limit," he said. "So what's better, what's worse — slicing a million birds a year through the windmills, which are permanent? Or a semi-permanent, temporary oil well that the [sage] grouse — there's no effect that I've ever seen from it." He called oil sands destructive, but he also cast coal mining as a long-term benefit for the ecosystem under certain conditions. "Montana's one of the only states that demands the coal companies put [land] back the way it is, with all the imperfections," he said. The mining industry has long rebelled against requirements that reclamation re-create pre-mining geography. It's an argument most prevalent in Appalachia, where mountaintop-removal mining is billed as providing flat land for farming and shopping malls. "The private land would prefer it to go productive, because it's actually more productive when you mix the topsoils up a little," Zinke said. "You can get better crops on it; you can have the rolling hills. It's more productive than what [Montana is] doing — if you have a rattlesnake den, they're going to demand you replace the rattlesnake den. ... If you have more productive land, then that means you're going to have, as far as your game goes, your game's going to have more feed." Zinke and Berry spent the half-hour program discussing a range of scientifically dubious explanations for global warming — with Zinke mostly asking questions while Berry explained why he shouldn't worry about climate change. "You're looking at the polar cap, and whether you go south or [to the] North Pole — something's happening. 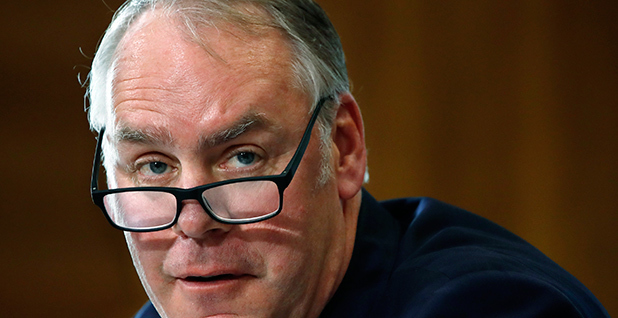 You have chunks the size of Connecticut being dropped off the pole," Zinke said, later describing a trip to Glacier National Park and watching the ice retreat while he ate lunch. "It was a hot day, but I physically watched the glacier recede a foot," he said. "So something's happening. What's driving this change?" Berry responded that the planet undergoes cycles, adding that accounts from early 20th-century Russia describe similar conditions to those of the present day. "We had a warm cycle up to about 2000, and now it's getting colder again," Berry said. "Just to extrapolate from, say, the last 40 years is not a valid way to predict the future." Berry also correctly explained that volcanic eruptions can lower temperatures by reflecting sunlight. Zinke replied: "OK, dispelling myth No. 2. OK, I'm learning a lot here." Much of the conversation centered around the ocean's role in regulating temperatures and storing carbon dioxide. "You look at some simple numbers, and you say we're not causing the change we're seeing in carbon dioxide. We aren't even close to overpowering nature. That's No. 1," Berry said. "Then you get into No. 2, does the carbon dioxide really affect the temperature, and there's all kinds of arguments against that. It doesn't, OK? The sun turns out to be far more powerful, if we accept the real data." Zinke — who said he planned another episode with a guest who believes in climate change — asked Berry why his explanations didn't align with other scientists. Berry replied that academics risk losing grant funding if they deviate from mainstream climate science and claimed that other countries' scientists know better. Interior Department spokeswoman Heather Swift defended Zinke for having "many guests on his [radio] program who expressed a variety of views and opinions." "Mr. Zinke would always challenge his guests to defend their opinions regardless of the topic and no matter how controversial," she said in a statement to CNN.